Black, white, cream, pale pink, pale blue, pale green and pale purple. If you purchase the pendant, please send me a message to let me know which colour you would like. 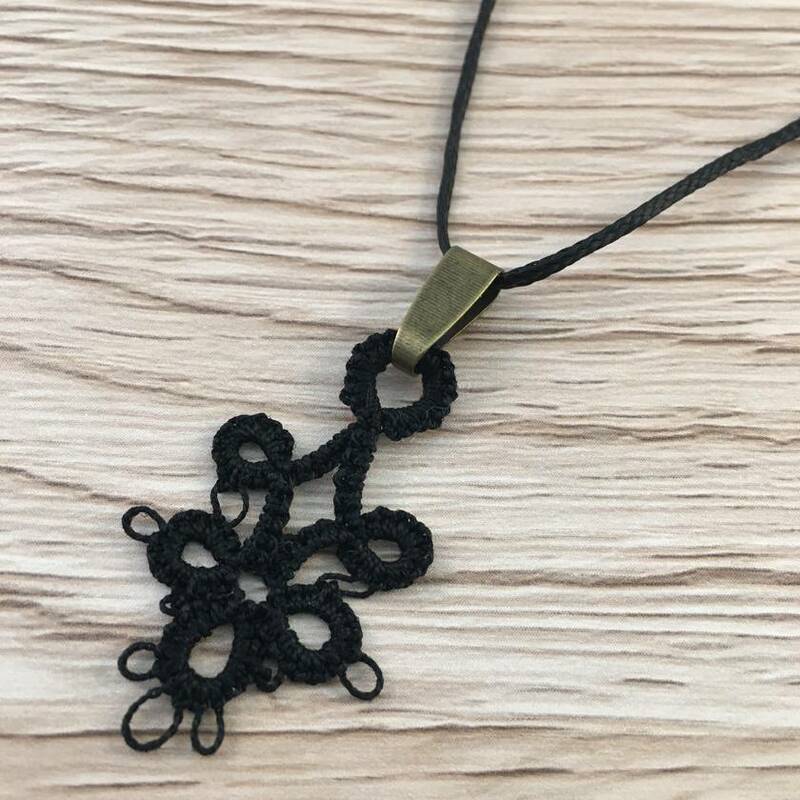 This pendant has been hand crafted using tatting shuttles and 100% cotton thread, making every piece completely unique. The lace has been stiffened with a fabric stiffener to help the lace keep its shape while being worn. The pendant is strung on black waxed cord with slip knots so you can adjust the cord to your desired length. The attachment is made of antique bronze coloured metal alloy. The lace measures approximately 20mm x 30mm. 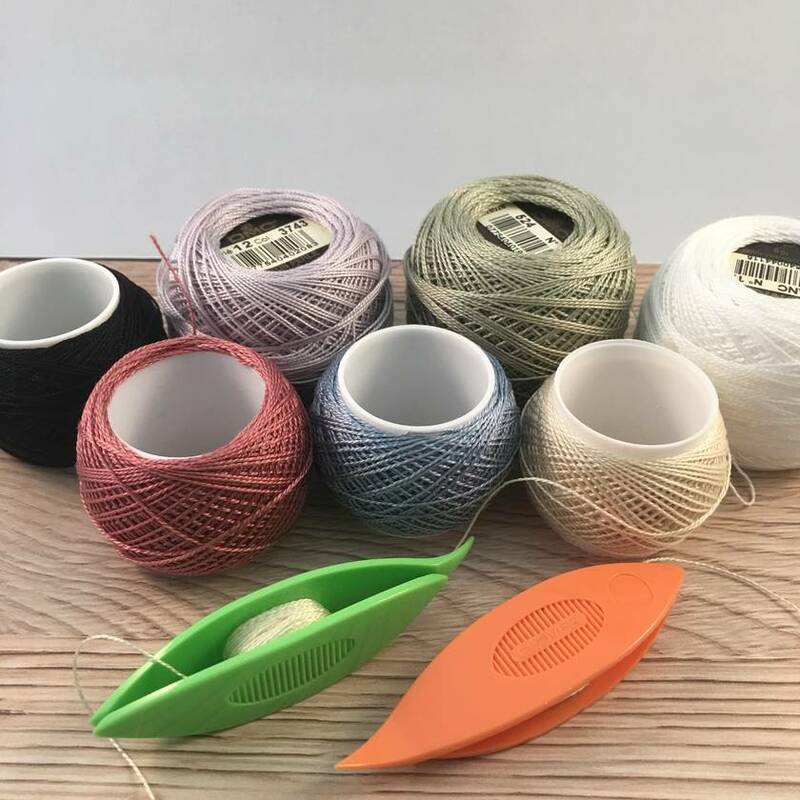 Note: due to the handmade nature of the lace and the size/brand of cotton used, some pieces of lace may be slightly larger or smaller than this. Jewellery made of lace is very light, so you barely know you are wearing it. 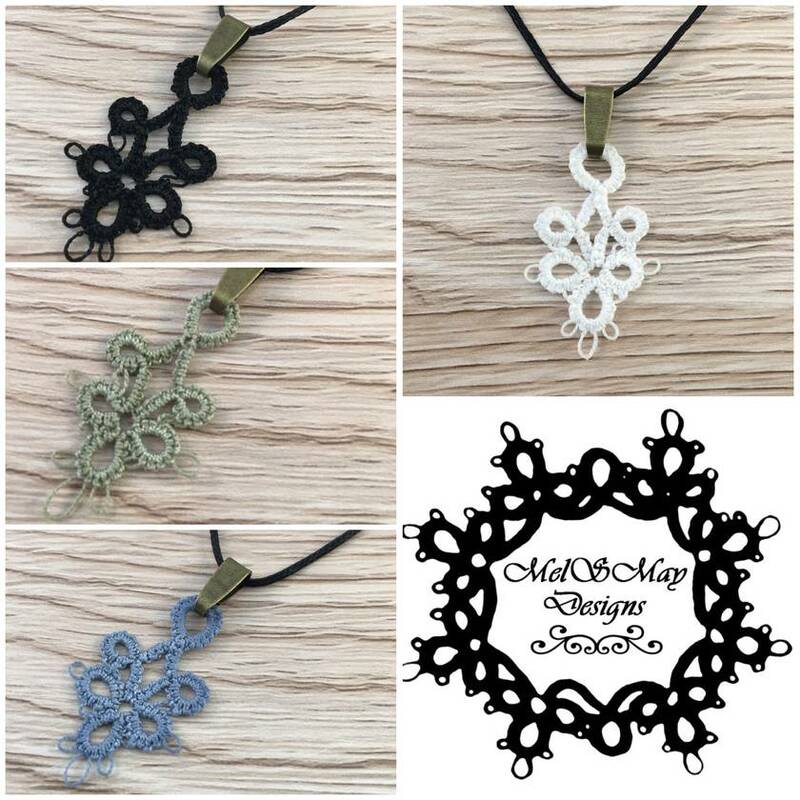 A feminine and vintage touch to your wardrobe, stand out from the crowd with this pendant designed and made in NZ by MelSMay – not many people have heard of the art of tatting! Can be cleaned with a slightly damp cloth and left flat to dry. Try not to get it wet, but if you get caught in the rain don’t panic! If you leave it on a flat clean surface, it should dry out and maintain its shape. Just do not immerse it completely in water. The pendant will be delivered to you in a plastic sleeve and a special card pocket to keep it flat and safe from the elements. It will be sent in standard post – if you are not happy with this and would prefer it to be couriered so it can be tracked, please contact me for pricing. The pendant is made to order, so please allow up to five working days for it to be completed before being posted. I will contact you to let you know once it has been put into the mail. Contact melsmay to enquire about payment or shipping options.